It is a time of transition, in-between creative projects, a time to put aside paint brushes and reach for the pencil and pens. What better place to relax and ponder over new directions than doodling in the sketchbook. I suppose the arrival of a New Moon and Chinese New Year were on my mind, it seemed to be the direction for my drawings and scribbles. Here in the islands local celebrations include brightly colored decorations, lions dancing in Chinatown streets, and sharing plenty of good food with family and friends. The festivities herald seasonal change while allowing moments of reflection and offering hopes for another new year. It is a time of transition, … a good time to pause, take a breath, and recharge the batteries before continuing creative journeys, under a shining moon, like a phoenix reborn and filled with possibilities. I remember being introduced to the Red Cardinal as a child while visiting my grandmother on her farm in the eastern United States. She loved birds and made sure to have food for them spread on the ground and attached to the ancient pear trees that stood outside of the parlor windows. It was a perfect viewing spot especially during the winter months and the flash of scarlet against the white background was stunning. “Isn’t he a handsome fellow!” my grandmother would exclaim at the sight of a male cardinal visiting her offerings of seed and suet. “Isn’t she a pretty thing, “ my grandmother would say in a softer voice at the sight of a female cardinal joining the feathered party. Regardless of the season, when a cardinal’s familiar song and trill could be heard, my grandmother would pause in whatever she was doing and listen intently, as if the song were for her. Sometimes she would whistle in return, a conversation only the two of them could understand. Both my grandmother and mother would often comment while listening to a cardinal’s serenade, on how happy their song was and how wondrous that a scarlet fluff of feathers could be so filled with a contagious joy that one could not help but feel lifted in spirit from just hearing its voice. The Red Cardinal was introduced to the Hawaiian Islands in 1929 and became well established here. To this day when I hear the familiar piping, trills and song, I take a moment from my activities and enjoy the melody. It is like hearing a familiar voice, of a dear friend, who brings with them fond memories of childhood days and can lift the soul with song. Playing with watercolors in a new sketchbook (Stillman & Birn Zeta series), working through ideas for a new painting…and, well… one thing led to another. A native tree in the Hawaiian islands, the ʻōhiʻa lehua is the first plant to grow on new areas of lava flow. The ‘I’iwi is a scarlet Hawaiian honeycreeper, a native bird with a unique bill shaped for drinking nectar. 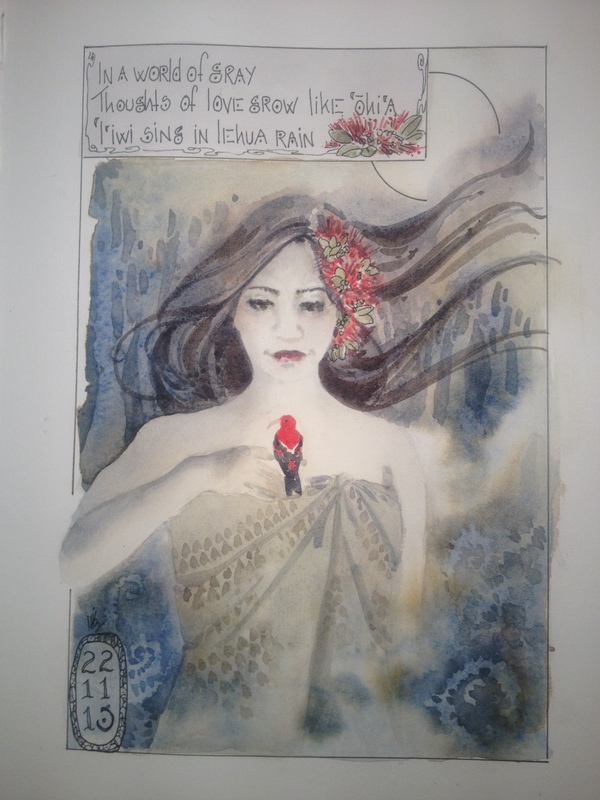 The term “lehua rain” refers to the legend of the ‘ōhi’a tree where plucking a flower causes the heavens to weep at the separation of two lovers, ‘Ōhi’a and Lehua.